The fact remains, more than 70 people, including at least 20 children, were killed in the chemical attack on Tuesday and the world leaders are bickering in a media and propaganda war. The devastation of the Syrian attack will live on for years, perhaps buildings will be replaced, roads rebuilt but the children of today will live with this for the rest of their lives. Affected, afflicted and traumatised, the legacy of this war. Although it is important to determine who is responsible, the most pressing issue has to be to provide aid to the Syrian people who have been affected by the attack. Most the world has stood up to condemn this horrific attack, but how many will serve the aid agencies without harbouring their own agendas. Israel has commented on how it should get involved, The US is threatening to offer a unilateral action to swiftly quash the regime.More than 70 people, including at least 20 children, were killed in the chemical attack on Tuesday. The voiceless victims of this war. The Russian allies say the deaths were caused by a leak from an arms depot where rebels were making chemical weapons after it was hit by a Syrian air strike. Rebels deny this. Rebels have in recent weeks launched two of their boldest offensives in many months, attacking in Damascus and north of the government-held city of Hama. The army says both assaults have been repelled. The Syrian military denied using any chemical agents, while its ally Russia said an air strike hit a rebel depot full of chemical munitions. Russia, which has carried out air strikes in support of President Assad since 2015, said the Syrian air force had struck Khan Sheikhoun “between 11:30 am and 12:30 pm local time” on Tuesday, but that the target had been “a large terrorist ammunition depot” on its eastern outskirts. It went on to say that location was known to hold chemical weapons and leading to the assumption that it was a rebel attack. Aid agencies, not concerned with who and why, for now at least, are rapidly trying to aid the victims, women and children being the most afflicted. At the same time, trying to aid the relief work to carry out an accurate assessment of the details of the attack are increasing difficult in this conflict zone. Analysts predict some 400,000 people besieged in the area near Damascus are now suffering and have a shortage of medical supplies, their hospitals have been bombed, and they are running out of food and other supplies. The World Health Organisation said on Wednesday that the likelihood of a chemical being responsible was “amplified by an apparent lack of external injuries reported in cases showing a rapid onset of similar symptoms, including acute respiratory distress as the main cause of death”. 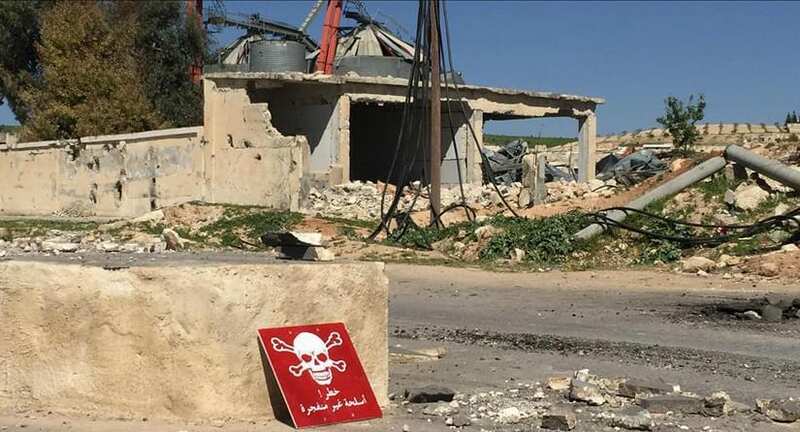 Turkey’s justice minister says autopsy results have revealed that chemical weapons were used in an attack which killed more than 80 people in Syria’s Idlib province. Thirty-two victims of Tuesday’s attack were brought to Turkey where three subsequently died. Turkish Red Crescent dispatched two trucks of medical equipment to the victims affected by Tuesday’s chemical attack in Syria’s Idlib province, Red Crescent director general said on Thursday. More than six years into the Syrian conflict, Assad appears militarily unassailable in the areas of western Syria where he has shored up his rule with decisive help from the Russian military and Iranian-backed militias from across the region. The Syrian government views all the groups fighting it as terrorists with agendas determined by foreign governments including Turkey, Saudi Arabia, Qatar and the US. The UN called for an urgent ceasefire in Syria’s Eastern Ghouta region, near Damascus, to allow in desperately needed aid and avoid a repeat of the devastation seen in Aleppo. #SyriaGasAttack This is all what the doctors can do,no hospitals no medical tools,everything destroyed!